Welcome back for the 3rd post in the Self-Publishing Sunday series! Our topic today will be costs and earnings, also cleverly titled The Money Post. Because I’m original like that. Now, it probably won’t come as a surprise to you that self-publishing doesn’t come with the same financial perks as traditional publishing. At least, not for the average author. Traditional publishing involves companies sending authors advances, and unfortunately that’s not happening yet for self-published authors. Plus there are a whole lot of other financial differences, but you don’t want to hear about the money deal for traditional authors. If you did, you sure wouldn’t be here. 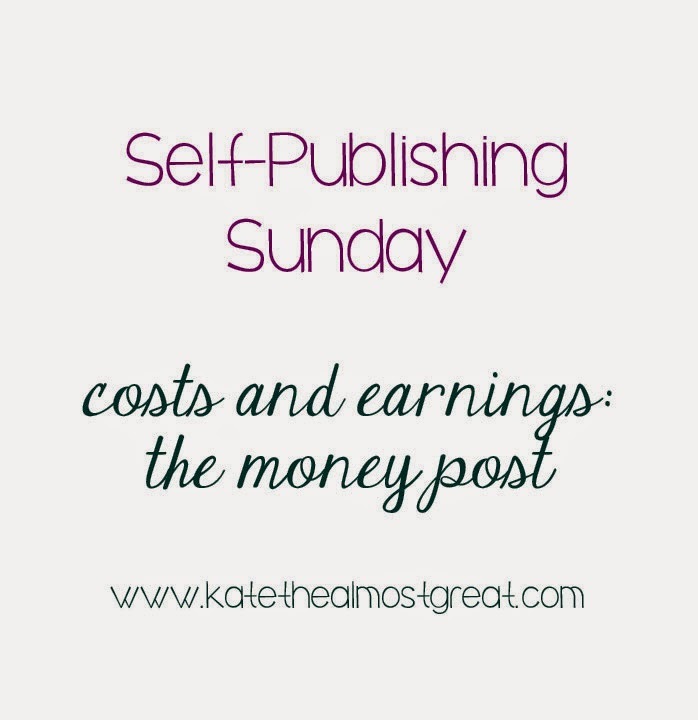 You should be aware, though, that there can be a lot of expenses with self-publishing. Most of them are start-up costs, especially if you don’t already have a solid online presence (that will be covered in another post). 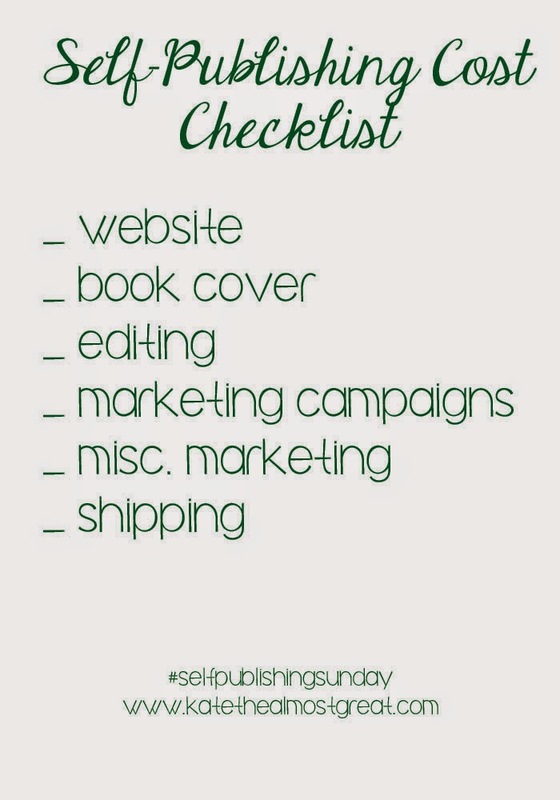 Here are a couple of things that you might need to spend money on, but in an easy checklist to help you out! 1. Website – Like I said, we’ll talk about online presence for authors later. But if you don’t already have one, you need one, and it definitely includes your own website. 2. Book cover – This is going to be your readers’ first impression of your book. It needs to get their attention and make them want to read more about it. You know the saying “Don’t judge a book by its cover”? Well we all know that people judge books by their covers. Or at the very least, people consider learning more about a book by its cover. So it’s pretty important, and it’s one of the more worthwhile investments. 3. 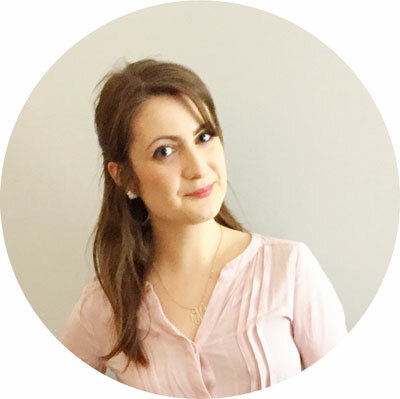 Editing – Maybe you have family or friends who are really good at editing who can help you. But, more than likely, you’re going to want a professional to edit for you. After looking at the same pages and screen over and over and over again, it will all start to run together. You definitely need an editor. 5. Miscellaneous marketing – This would be sort of the bits and pieces of marketing. If you don’t pay for an official campaign, then you’ll probably end up having plenty of miscellaneous pieces. (Not to say that the miscellaneous bits would cost more than a campaign. That will depend on you.) I’m talking about things like paying bloggers to write posts to advertise your book, or buying an e-book about how to advertise your book. For those of you bloggers, think about this category like blog sponsorships. 6. Shipping – If you want to send a hard copy of your book to someone (yourself, family, friends, people to review, libraries, etc. ), it will cost some money. This is just your standard shipping price, but it can add up. The moral of the story is that you can spend as little or as much as you want. I can’t promise that spending hundreds of dollars will translate into dramatically improving your book sales. But I can promise that not spending anything will most likely really hurt them. It’s great that more and more authors are publishing their books on their own. But you need to make sure that your book stands above the others out there, especially because you don’t have a publishing company like Random House to market your book for you.